www-mysearch.com is the PUP that uses misleading techniques to prevent removal. Use Reimage to locate malicious components and get rid of them faster than with uninstall instructions. A full system scan blocks virus reappearance and prevents traffic to malicious domains. www-mysearch.com is a browser hijacker that can affect Google Chrome, Mozilla Firefox, Safari, Internet Explorer or other web browsers by altering their settings. These suspicious applications typically invade users' machines without their consent, using software bundling method. Because of that, browser hijackers are also categorized by security researchers as potentially unwanted programs. Altered browser settings, excessive advertisement, browser slowdown, etc. Developers claim that the application applies very strict requirements to the search results, so the links that it provides are most accurately selected. However, it is not precisely the case. The truth is that www-mysearch.com hijacker creators only want monetary benefit by exposing users to as much sponsored content as possible. Therefore, the claims that the results are accurate are false and users have to deal with excessive advertisement instead. We do understand why users might be tricked into wanting to keep the PUP. 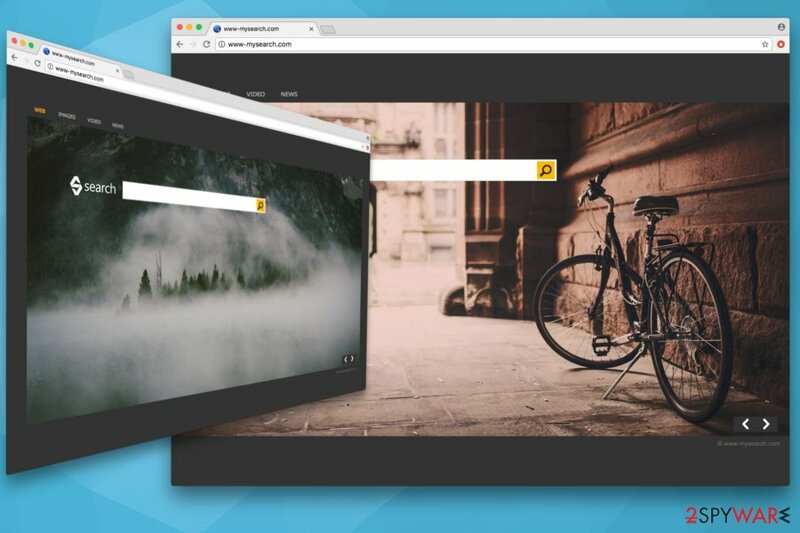 www-mysearch.com allows users to swap the backgrounds, which show spectacular views and the overall design of the website is simple, yet good-looking. However, do not get deceived by these beautiful sightings as the dubious app can put your virtual and computer safety at risk. You should remove www-mysearch.com as soon as you notice it, especially if it entered your machine without permission. There is a handful of reasons why people should not use this search site. Generally speaking, the search results that it may provide are very unreliable if compared to Google, Bing or Yahoo. 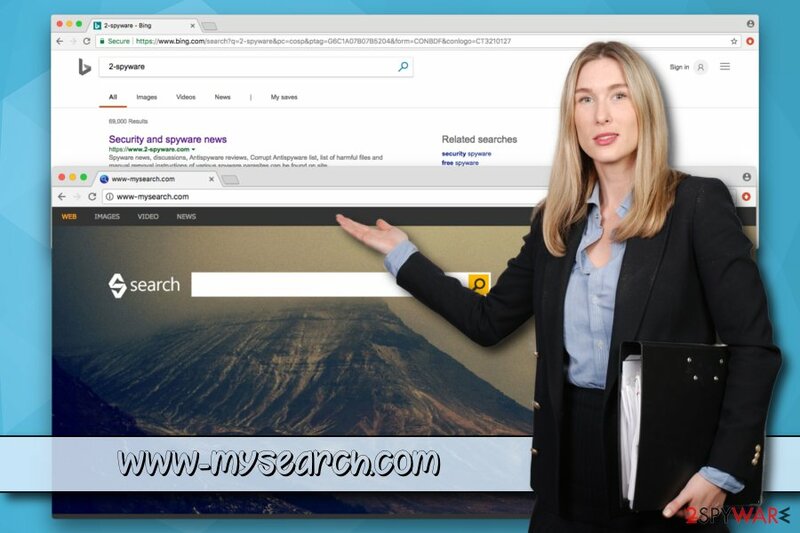 Even though Bing is legitimate, you should not rely on it when it's related to www-mysearch.com virus or another search engine. Bing is only reliable when not in collaboration with third parties. www-mysearch.com is a browser hijacker. Therefore, this dubious app alters the startup page, new tab URL, and search engine and sets it to www-mysearch.com. This change might seem minor initially. However, if users decide that they want to navigate to the usual search engine, they will notice that action is impossible, as the hijacker reapplies merely its settings automatically. 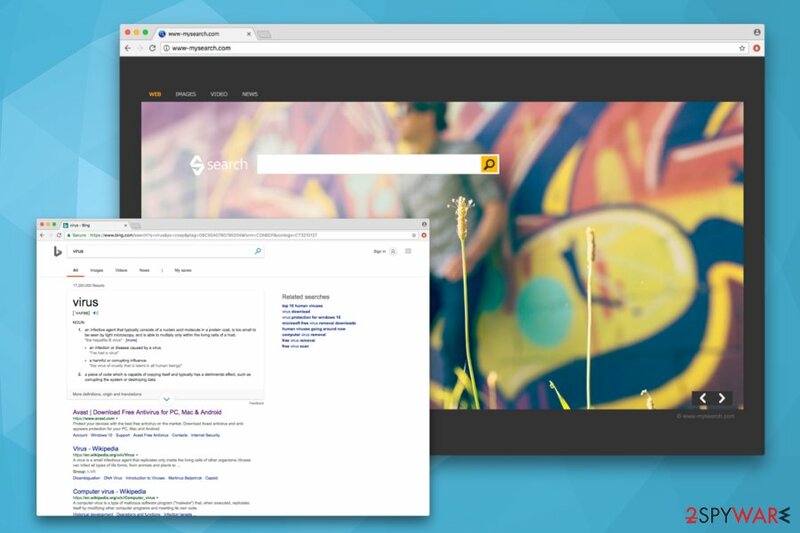 www-mysearch.com is related to unknown parties and can cause browser's redirects to unsafe websites. Our security experts have checked search results that this search engine provides and found out that a considerable part of the links provided is sponsored. When we speak of third-party search engines, that is not surprising. However, the redirects raise the alarm because some third-parties may try to misuse this engine for spreading other PUPs or even viruses. In addition to suspicious redirects, the PUP can display an enormous amount of advertisements. Internet browsing sessions might be turned into hell when every single website you visit is covered in pop-ups, hyperlinks, banners, video ads and similar. If you are not willing to receive such third-party content, you should not postpone www-mysearch.com removal. The unwanted application can use personally non-identifiable information (search terms, pages viewed, clicks, hardware/software information, browser's type, language, IP address, PC's location, etc.). Such data is collected to create an online profile then flood users with targeted advertisements. Once www-mysearch.com virus corrupts registries, settles down in Windows startup and starts executing processes on Task Manager, each of the web browsers may slow down, freeze, and crash more frequently then it used to. If you have already experienced www-mysearch.com redirects, slowdowns, and other inconveniences, we recommend installingReimage and initiating full system check. After that, your web browser will be PUP-free and perform as smoothly as just installed. Browser hijackers are classified as potentially unwanted programs because they spread using software bundling – an extremely popular marketing campaign used by freeware developers and PUP creators. It is unlikely that users would inject their machines with countless advertisements and system slowdowns. When in Advanced mode, remove any ticks next to add-ons, media players, toolbars, browser extensions and similar useless software. It goes without saying that www-mysearch.com removal should be your top priority. Such dubious applications are never a good idea to use. Thus, we recommend using legitimate Bing search engine, as it will not spam you with unwanted advertisements or slow down your browser. You remove www-mysearch.com virus either manually or automatically. The latter is more convenient and only takes a few minutes. All you have to do is download a reputable security tool, bring it up to date and perform a full system scan. Alternatively, you can also get rid of www-mysearch.com manually. You will find our detailed guide below this article. However, do not pick this method if you are not that computer-savvy individual. Here, look for www-mysearch.com or any other recently installed suspicious programs. Wait until you see Applications folder and look for www-mysearch.com or any other suspicious programs on it. Now right click on every of such entries and select Move to Trash. When in the new window, check Delete personal settings and select Reset again to complete www-mysearch.com removal. 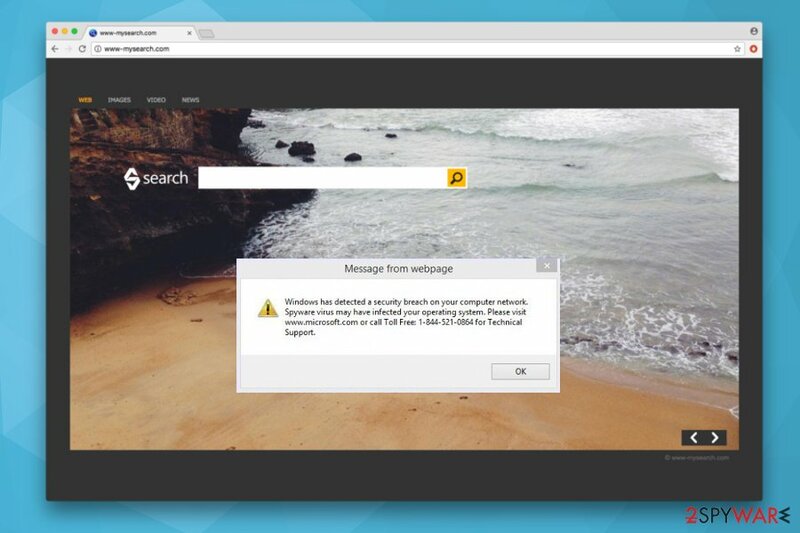 Once these steps are finished, www-mysearch.com should be removed from your Microsoft Edge browser. Here, select www-mysearch.com and other questionable plugins. Click Remove to delete these entries. Now you will see Reset Firefox to its default state message with Reset Firefox button. Click this button for several times and complete www-mysearch.com removal. Google Chrome's settings must be brought back to default after PUP uninstallation. Here, select www-mysearch.com and other malicious plugins and select trash icon to delete these entries. Click Reset to confirm this action and complete www-mysearch.com removal. Here, select Extensions and look for www-mysearch.com or other suspicious entries. Click on the Uninstall button to get rid each of them. Here, look at the Homepage field. If it was altered by www-mysearch.com, remove unwanted link and enter the one that you want to use for your searches. Remember to include the "http://" before typing in the address of the page. Now you will see a detailed dialog window filled with reset options. All of those options are usually checked, but you can specify which of them you want to reset. Click the Reset button to complete www-mysearch.com removal process. ^ Browser hijacker (browser hijacking). SearchSecurity. Free online information about internet security. ^ NON-PERSONALLY IDENTIFIABLE INFORMATION. MMA/ Mobile Marketing Association. This entry was posted on 2019-04-01 at 00:37 and is filed under Stealing programs, Viruses. You can quickly scan the QR code with your mobile device and have www-mysearch.com manual removal instructions right in your pocket. How did you remove www-mysearch.com?